With the presence of a large pool of participants, the Global mobile security market is displaying a highly competitive business landscape, finds a new research report by Zion Market Research (ZMR). Symantec Corporation, Apple Inc., Microsoft Corporation, Kaspersky Lab, Intel Corporation, and VMware Incorporation are some of the key vendors of mobile security across the world. These players across mobile security market are focusing aggressively on innovation, as well as on including advanced technologies in their existing products. Over the coming years, they are also expected to take up partnerships and mergers and acquisitions as their key strategy for business development, states the mobile security market study. Citing an instance, in August 2018, ESET- one of the biggest endpoint security providers across the globe- declared the availability of its new security services for helping IT groups avoid, detect, respond, and determine cyber threats. In another move that can spur the expansion of mobile security market, on September 5th 2018, Juniper announced the extension of its collaboration with Ericsson for moving from 4G to 5G network along with enhancing of its security solutions. As estimated in this report, the global mobile security market stood at US$ 24.17 billion in 2017. Witnessing a tremendous rise during the period from 2017 to 2023, the revenue in this mobile security market is expected to reach US$46.74 billion by the end of the forecast period. “Growing requirement for safeguarding digital content on mobiles along with securing protection against unauthorized access to mobile applications will drive mobile security market size,” says the author of this study. Apart from this, today consumers make prominent use of smartphones to carry out online transactions and these cashless deals are prone to cyber attacks, thereby leading to higher demand for mobile security services. In addition to this, growing necessity of protecting user authentication, DRM, and trusted playback is likely to influence the growth of mobile security market over the years ahead. The high price of security software, however, is forecast to obstruct the expansion of mobile security market in the ensuing years. Nevertheless, the drastically changing trends witnessed in wearable devices sector along with high preference for smart watches will drive the progression of mobile security market within the next few years. This in turn will normalize the impact of hindrances on the mobile security market, reports the study. 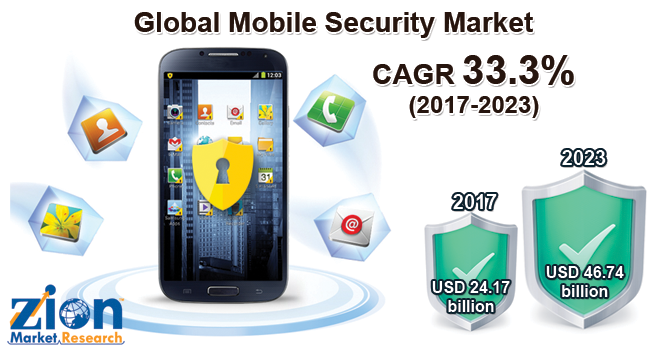 Regionally, North America has been leading the worldwide mobile security market and is anticipated to continue on the dominant position in the years to come, states the mobile security market study. Growing use of PCs, smartphones, iPhone, and tablets is the main factor behind the dominance of the North America mobile security market. The presence of large number of manufacturers in the region is another significant factor that is supporting this regional mobile security market.